Chicago Review Press, 9780935607345, 144pp. Action Art: Hands-On Active Art Adventures is A Collection of Over 100 Active Hands-On Art Experiences for Children 2-12, Full of Adventure, Movement, and Discovery. Full color photographs highlight all activities including painting, photography, collage and sculpture, each with helpful icons indicating levels for both children and adults. Action Art experiences are built on the knowledge that art for children is a creative process and not just a finished product. MaryAnn Kohl is famous around the world for encouraging children to experience creative art exploration best known as “process art”. 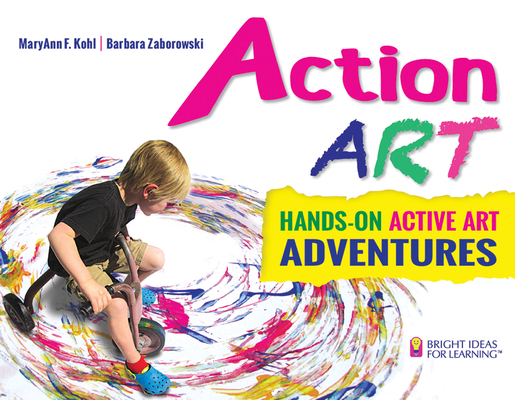 MaryAnn F. Kohl and Barbara Zaborowski have invented and refined the activities in Action Art with the belief that children actively explore and discover art as a process of creating. The finished product is the unique outcome of their involvement. Expect to see involved participation, inspired imagination, and a deeper challenge to their thinking.